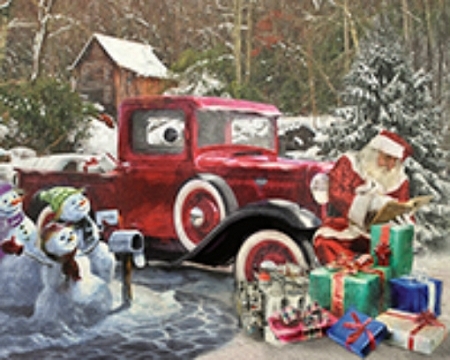 The jovial guy is double-checking his list before setting out on his yearly journey in a classic Ford truck - bright red, of course! Packages are gaily wrapped and piled up for distribution, and a family of snowmen have some last-minute requests ready to mail to Santa. Artist Robert Kramer. 1,000 piece puzzle. Finished size 24" x 30".